Distribution: All over Lake Tanganyika. 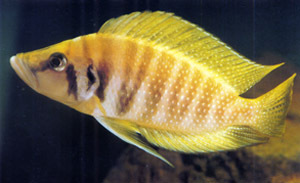 Max size: Males 4" females 3". 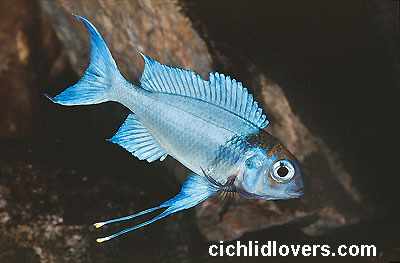 Habitat: Found in the rocky areas with caves unlike the Cyprichromis species which are in mid water. 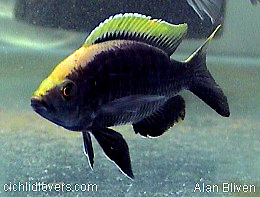 Behavior: Much different than the Cyprichromis species. 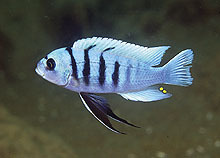 Whereas the Cyps are a fast moving, intense fish that lives in mid water without any rocks and loves bright lights. 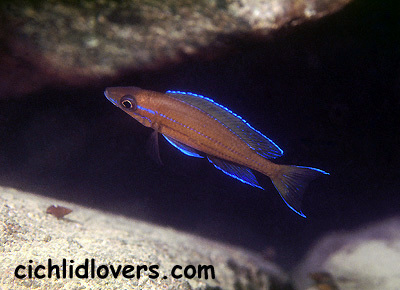 The Blue Neon is a slow moving rock bound fish that does and looks better with dimmer lighting. 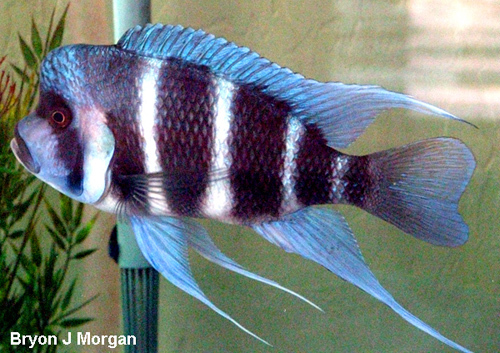 It also may be the most peaceful cichlid in the world. 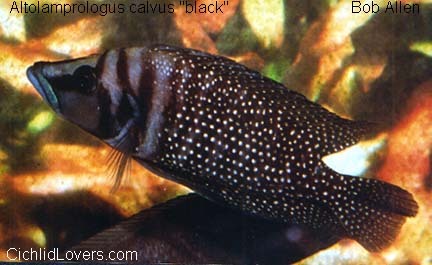 They swim close to the rocks and are found at all angles, even upside down. 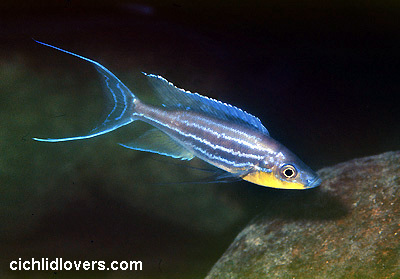 Maintenance: Best kept in in a 2'+ long tank with a lot of large rocks. 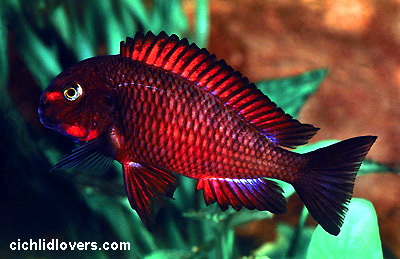 Not a delicate fish but compatibility can be a problem if kept with larger more aggressive species. 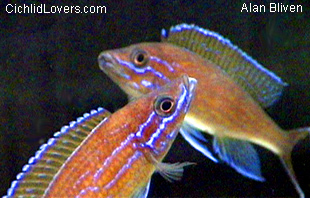 Make great tank mates for many of the more delicate Tanganyikans such as the Featherfins or sand dwellers. 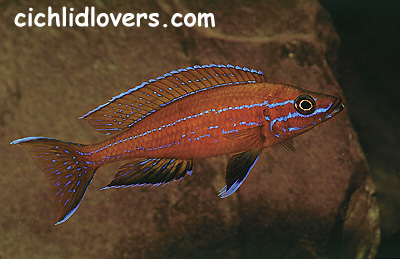 But can be kept together with many other Cichlids and even non-cichlids. Breeding: A polygamous mouthbrooder in which the male defends small territories in cave ceilings or the sides of large rocks. They differ with "Cyps" again in their breeding method. 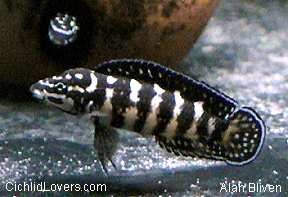 Whereas "Cyps" breed right in mid water, The "Paracyps" breed horizontally alongside a large rock and roll the egg along side the rock. Best to have a large piece of slate at a 45 degree angle for them to spawn on. But it's not needed. My group are kept in a bare tank with only a large "Hydro Sponge" for an ornament. I assume they spawn on it. The eggs are very large and few in number. 10-12 is considered a large spawn but they do spawn about every month or so. 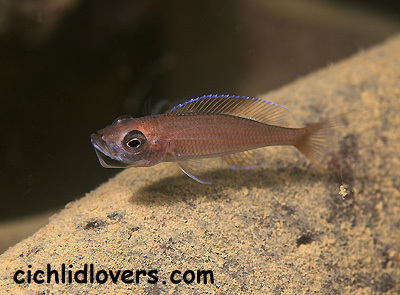 The fry are very large upon being released by their mother and grow fast and reach sexual maturity at about 8 months. Comments: The pictures don't show it very good but they get a nice lyretail on them. 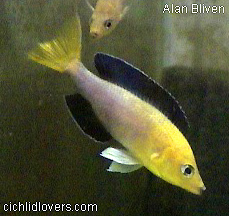 There is also an albino version which is very colorful, rare, expensive and in demand but is not very prolific.